I've always loved Chicken Parmesan but I rarely have it because it's not diet friendly. I was so excited to come across a healthier version of Chicken Parmesan. This dish is so tasty and doesn't leave me feeling guilty. It was a hit with the hubster and my picky toddler as well! In a skillet pan over medium-high heat, add the oil, garlic, oregano, red pepper flakes, and salt and cook about 1 minute. Add the crushed tomatoes, water, chicken broth, and the pasta to the pan, stirring to combine. Bring the mixture to a simmer, then cover the pan and continue simmering until the pasta is tender, about 16-18 minutes. Stir the pasta frequently as it cooks. Once tender, remove the cover and stir in the Parmesan cheese, pepper, and the cooked chicken. Transfer to a baking dish and sprinkle the top evenly with the mozzarella cheese. 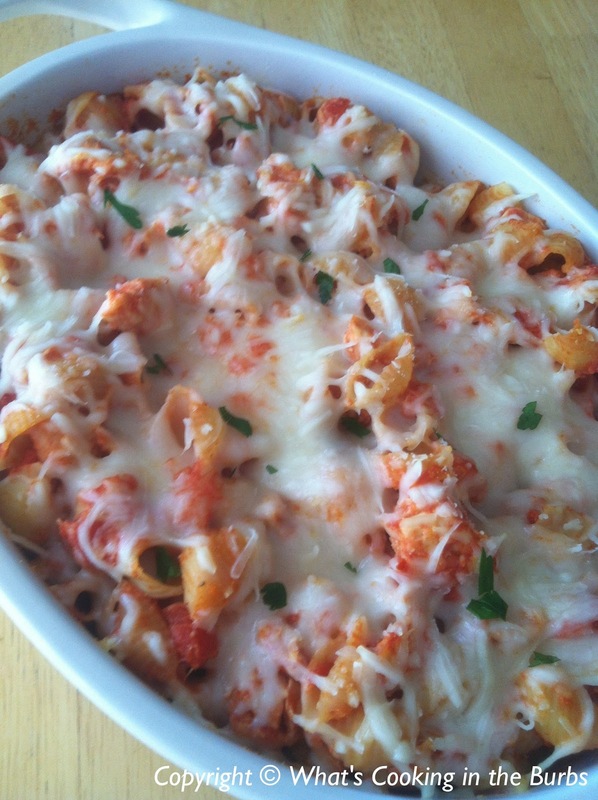 Place in the oven and bake for 10 minutes, or until the cheese has melted and is bubbly. Garnish with fresh basil or parsley if desired. Enjoy! My family.would love this. Pinned! Wow! This looks amazing! I just pinned it and can't wait to make it for my family. I like the flavors of Italian food, but can't eat all the pasta. This is a wonderful solution for me. Thank you for sharing this. Think I have all the ingredients, except the chicken, which I buy as needed ! Love the recipe and the use of mozzarella :-) Thank you for sharing at our ALL MY BLOGGY FRIENDS Party ! Sorry you think that. I calculate through my fitness pal.